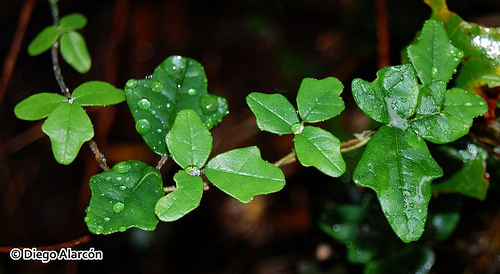 Boquila trifoliolata is a climbing plant endemic to the swathes of temperate rainforest covering vast areas of South America. Herbivory and grazing is often intense in these areas, and being able to climb away from the prying jaws of potential predators is advantageous for a plant like Boquila trifoliolata. However, one particular attribute separates this clever customer from the other climbing vines found in abundance in rainforest environments. It possesses an extraordinary and unique ability to disguise itself as other plants, altering its development programme to produce different leaf shapes, sizes and textures to match the particular plant is it climbing over. In doing so, it camouflages itself against potential herbivores, blending in with its surroundings and reducing its chance of being eaten. Whilst mimicry is not a particularly novel concept, having been documented extensively in animals (think stick insects or David Attenborough’s famous Lyrebird capable of imitating a chainsaw) and to an extent in plants, this example is particularly incredible because Trifoliata is able to mimic a multitude of different plants. As well, it is also able to adapt and switch on the fly: the same individual vine can alter its morphology as it traverses different hosts. Following the vine from start to finish then means you could potentially see as many as 5 or 6 different leaf morphologies and structures. Truly a master of disguise. How Boquila trifoliolata senses which plant it is growing over is still up for debate, but the answer is thought to lie with volatile chemicals that are emitted by many plants. Often indiscernible to you or me, these wind-carried compounds allow plants to communicate: a recent documented example showed that plants release specific compounds when grazed on by a herbivore. These compounds are perceived by other plants in the surrounding area and serve as a warning telling them to upregulate their defences and avoid their compatriot’s mastichatory demise. Though they can be general in purpose and non-species-specific in composition, they needn’t be. Flowers often produce a precise and species-specific cocktail of volatiles in order to attract the right pollinator and ensure dissemination of their pollen. Coming back to the Boquila trifoliate story then, it is thought the plants trifoliata climbs over each produce their own specific mixture of volatiles. In turn, sensing of these compounds by trifoliate acts as the stimulus to alter its developmental programme, causing different leaf morphologies to be produced. This incredible plant is literally a shapeshifter.